The CERES Experiment is a NASA project that measures Earth's incoming and outgoing energy. 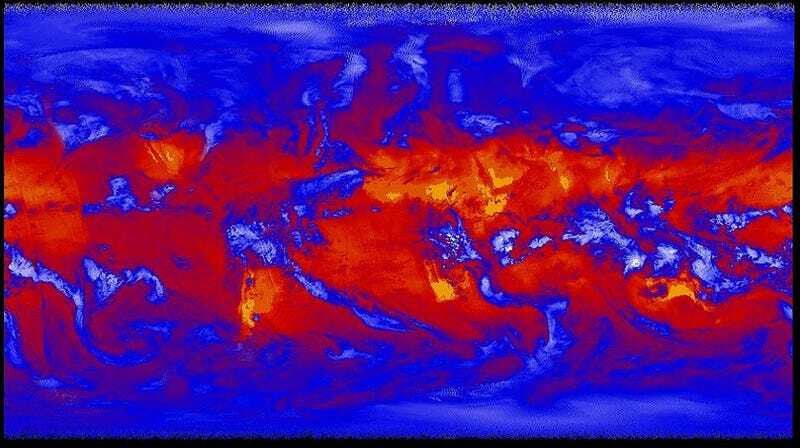 The picture above is a look at Earth's reflected heat energy, as it would be seen from space. CERES stand for "Clouds and the Earth's Radiant Energy System." The project began in 1997, when a satellite started monitoring rainfall data throughout the tropics. It expanded from there — incorporating data like the aerosol composition of the atmosphere — with the goal of monitoring the overall energy "budget" of the Earth and how the imbalance of that budget affects clouds' motion. Basically, if you're looking at the sky and wondering if global warming will transform your neighborhood into a parched, barren wasteland, CERES would be able to give you the best prediction. The picture above comes from their latest endeavor, the Suomi NPP satellite, which monitors how much the clouds reflect heat back into space. As anyone under cloud cover knows, it gets cold under there, as the sun's energy is bounced back into space by the clouds, making a radiant-energy picture of the Earth look pretty strange. Heat, the actual jiggling of atoms, doesn't travel well through space. But hot things tend to give off lots of infrared radiation, a wavelength of light that is too long for our eyes to see. The infrared is what we actually see when we're looking for "heat signatures" (a.k.a. Predator vision). The color coding shows the number of watts per square meter, with yellow putting off nearly four hundred, red coming it at a strong three hundred, blue dropping to two hundred, and white an icy sixty-seven. Here's what the above photo looks like with the infrared removed. Any aliens that looked at our planet would mostly see swirling clouds instead of large, stable land masses. Images: NASA/NOAA/CERES Team. Via NASA.